BREITLING REF. A37320 SUPEROCEAN SPECIAL EDITION STEEL Breitling, Officially Certified Chronometer, Superocean, Special Edition 200 m, No. 1196211, Ref. A37320. Sold December 8th, 2010. 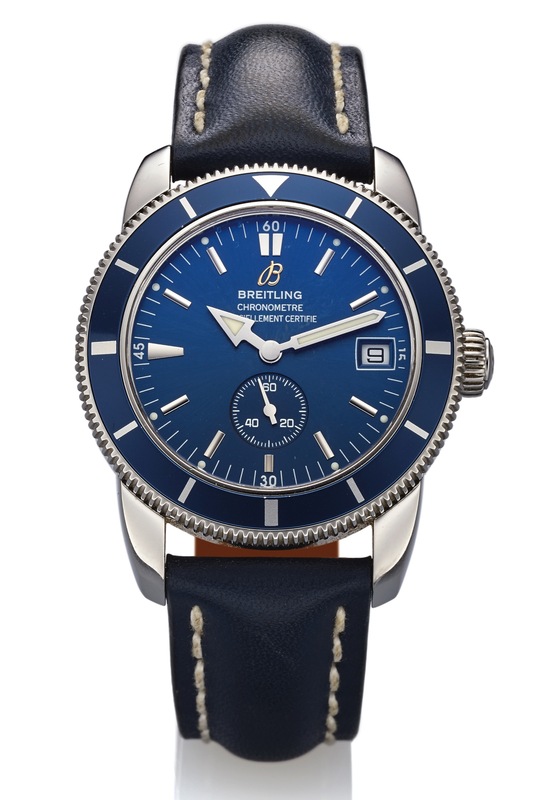 Fine, stainless steel, self-winding, water-resistant diver's Chronometer wristwatch with black bezel and blue dial, date and a Breitling stainless steel deployant clasp. Accompanied by the original fitted box, Chronometer certificate, warranty and instruction manual. Three-body, polished, graduated unidirectional rotating bezel for the decompression times, screw-down crown, lapidated lugs, screw-down case back, sapphire crystal. Blue with applied steel baton indexes and luminous dots, outer minute divisions, subsidiary seconds dial, aperture for the date. Polished luminous steel arrow hour and baton minute hands. Cal. 37, rhodium-plated, 27 jewels, straight-line lever escapement, monometallic balance, shock absorber, self-compensating flat balance spring, hack mechanism. C. Three-body, polished, graduated unidirectional rotating bezel for the decompression times, screw-down crown, lapidated lugs, screw-down case back, sapphire crystal. D. Blue with applied steel baton indexes and luminous dots, outer minute divisions, subsidiary seconds dial, aperture for the date. Polished luminous steel arrow hour and baton minute hands. M. Cal. 37, rhodium-plated, 27 jewels, straight-line lever escapement, monometallic balance, shock absorber, self-compensating flat balance spring, hack mechanism. Dial, case and movement signed. DIAM. 38 mm. THICKNESS 12 mm.